Washington, April 9: The US State Department on Monday barred entry of 16 Saudi nationals into the United States over what it described as their alleged role in the murder of journalist Jamal Khashoggi last year. 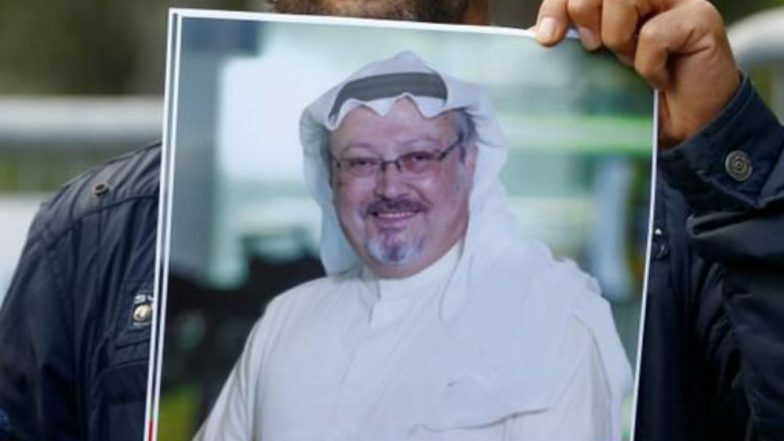 Khashoggi was killed on October 2, 2018, in the Saudi consulate in Istanbul sparking scrutiny of the kingdom's human rights record. The announcement by Secretary of State Mike Pompeo comes as the Donald Trump administration faces pressure from the Congress counterpart over its response to the killing of Khashoggi. Jamal Khashoggi Murder Fallout: Rift between Saudi King Salman and His Heir Crown Prince MBS. The 16 Saudis nationals banned from entering the US are -- Maher Mutreb, Saud al-Qahtani, Meshal Albostani, Naif Alarifi, Salah Tubaigy, Mohammed Alzahrani, Khalid Alotaibi, Mansour Abahussain, Waleed Alsehri, Thaar Alharbi, Abdulaziz Alhawsawi, Badr Alotaibi, Mustafa Almadani, Saif Alqahtani, Fahad Albalawi and Turki Alsehri, according to a press release issued by the US State Department. "The law requires the Secretary of State to publicly or privately designate such officials and their immediate family members," the statement further said. Jamal Khashoggi Killing: Members of Saudi Team That Murdered Journalist Received Training in the US, Says Report. According to a report in The Washington Post earlier this month, Saudi Arabia gave Khashoggi's children "million-dollar houses" and "five-figure payments" as compensation to their father's killing. The Kingdom has come up with long-term understanding with Khashoggi's children to inspire them to refrain from criticism to Khashoggi's killing by Saudi agents, the report added. Khashoggi, was a columnist with The Washington Post and a critic of the Saudi kingdom, was killed in Istanbul last year, where he went to obtain documents certifying his divorce with former wife Alaa Nassif, to marry his Turkish fiancee Hatice Cengiz. After denying it for weeks, Saudia Arabia admitted that the journalist was killed in Saudi consulate premises.